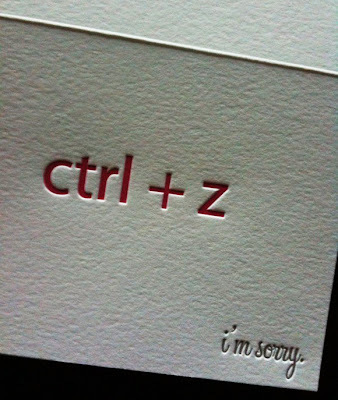 Single "ctrl + z, I'm sorry" letterpress card. A geeky fun way to express an apology! Where is the  + Z ? ;) Just had to express my fanboy-dom. I have to agree with windowi! it should be at least cmd + Z!!! LOL! This is so awesome. Ctrl-Z your fail. What a funny image, very original first comes the apology and then we go back before making the mistake.